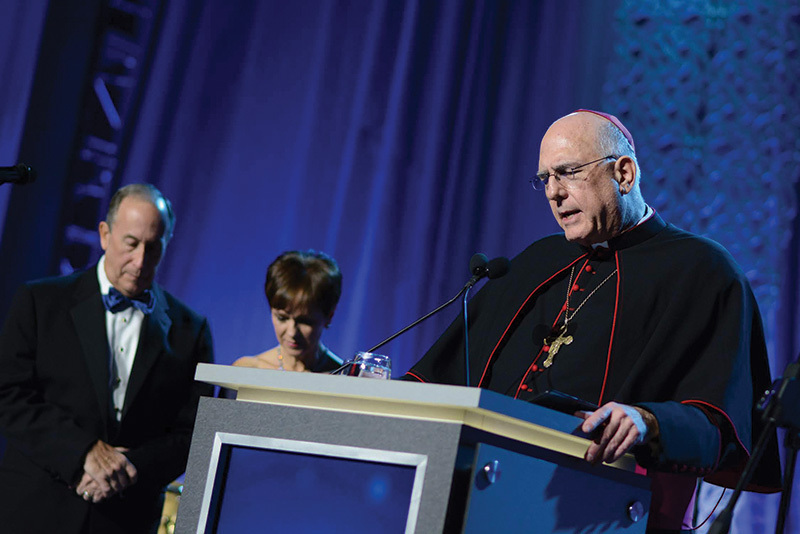 Archbishop Joseph F. Naumann delivers the invocation at the annual Catholic Charities of Northeast Kansas Snow Ball Jan. 19 at the Overland Park Convention Center. The Snow Ball raised $3,004,875. OVERLAND PARK— No rain, sleet or snow could prevent the 45th annual Snow Ball from happening Jan. 19 at the Overland Park Convention Center. More than 1,800 supporters attended the gala, which raised $3,004,875 for Catholic Charities Foundation of Northeast Kansas. Fran Watkins Douthat, a parishioner at St. Ann Church in Prairie Village, and her husband Neil led this year’s event as Snow Ball presidents. “A year ago, when we started this journey, I was nervous, intimidated and doubtful that we could fill the immense shoes of all the past presidents. How could we possibly raise enough money to fund all of these vital programs?” said Fran. They were encouraged to stop focusing on the dollar amount and, instead, focus on the mission. Like Fran, Neil also attributed the evening’s amazing success to the dedicated Snow Ball patron and table committee members, hardworking staff led by the new Catholic Charities’ president and CEO Lauren Solidum, combined with generous donors all passionate about the inspiring work of Catholic Charities of Northeast Kansas. “It was such a wonderful experience,” he said. Joining the Douthats were Don and Patty Kincaid, parishioners of St. Agnes Church in Roeland Park. They were recognized during the evening’s program as honorary presidents for their longtime contributions to Catholic Charities. Recently, they helped the organization with a new Mobile Resource Bus to serve rural communities. “Our budget was small for what we needed, but the Kincaids stepped up with a large heart,” said Denise Ogilvie, vice president of outreach and grants management at Catholic Charities. Like previous years, Snow Ball included a cocktail reception followed by a formal sit-down dinner. The Lost Wax band provided the live music. But this year’s event came with an unexpected surprise — a marriage proposal. Daniel Straub, son of Ernie and Susan Straub, dropped down on one knee and asked Laura Trickett, daughter of John and Jean Trickett, to marry him. She said “yes,” as Snow Ball guests shared in the young couple’s joy. Like many in attendance, Snow Ball is sure to hold a special place in their hearts for years to come.